Because sometimes a more corrective action is necessary, Bosley Professional Strength has developed a line of advanced hair and scalp treatments that address your clients individual needs. Treatments include a range of products from in-salon micro-dermabrasion to an Leave-in Volumizing Dry Shampoo for even your most active clients. A gentle, color-safe charcoal infused scalp exfoliating treatment that detoxifies, rejuvenates and invigorates the scalp. Supports scalp health by gently removing debris and build-up on the scalp and hair, energizes and rebalances the scalp. Wet hair. Part hair with fingers to expose scalp. Squeeze bottle as you run nozzle along exposed scalp areas. Massage into scalp, adding more water as needed to create a lather. Exfoliating particles will naturally dissolve. 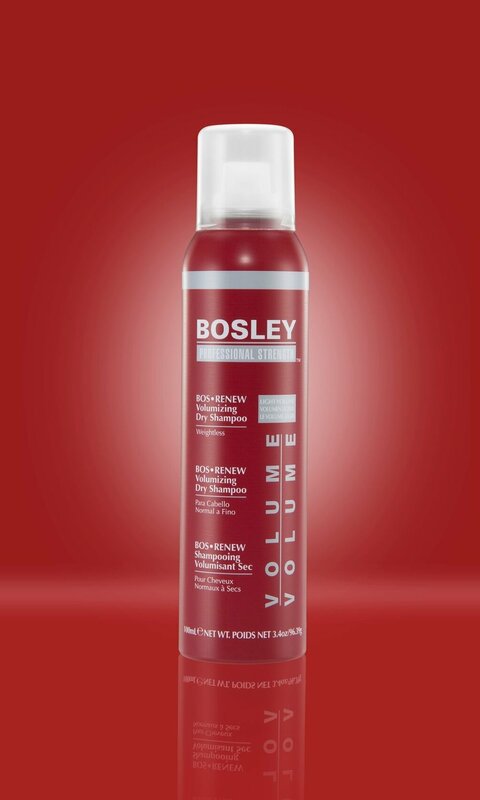 Rinse thoroughly and apply Bosley Professional Strength Healthy Hair Moisture Masque to strands. Use once a week to maintain a clean healthy scalp. If the hair has not been shampooed for several days, mix Bosley Professional Strength Nourishing Shampoo for an added cleanse. Protects and repairs the hair follicle while helping to support healthy hair function in areas of low density such as the hairline or areas where mechanical damage (hair breakage due to stress from braiding, pony tails, extensions) has occurred. LifeXtend Complex / Hydrates and nourishes while strengthening and fortifying the follicles and hair shaft for thicker, fuller-looking hair. Scalp Activators / May help raise follicle energy levels. Biotinyl-GHK / Helps protect and repair hair follicles. 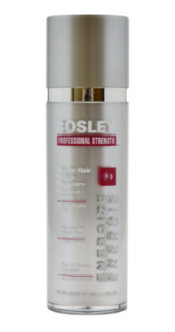 Intensive leave-in scalp primer spray which boosts the effects of other Bosley Professional Strength scalp treatments. Replenishing hair and scalp treatment with concentrated proteins and tri-peptides. Spray liberally to damp scalp and hair. Features Saw Palmetto, a natural inhibitor of DHT, a hormone linked to hair loss. FDA approved to re-grow hair! Clinically proven to help re-grow hair and slow down or help halt hair loss in some cases. 2% regular-strength formula for women. 5% extra-strength formula for men only. A dual-purpose weightless scalp and hair treatment for the scalp and hair. For all hair types. Rebalancing & Finishing Treatment may help rebalance dry and oily scalp, scalp itching, flaking, irritation and redness for healthier scalp. Rebalancing & Finishing Treatment is also a wonderful finishing product that provides fantastic nutrition, tames fly-aways and adds silky, smooth shine. Know as Africa's "Miracle Oil" Marula Oil is rich in antioxidants and a potent moisturizer, Burdock Root Oil helps maintain a healthy scalp and strengthens hair. Argan Oil provides fantastic nutrition and adds silky, smooth shine. Contains LifeXtend complex to help fortify hair and ColorKeeper to help extend color. Marula Oil / Known as "Africa's Miracle Oil," it is rich in vitamin E and C, antioxidants and Oleic Acid to help improve hydration and repair damage. Burdock Root Oil / Rich in essential fatty acids and Phytosterols, may promote healthier looking hair that has body and shine and helps maintain healthy scalp. Argan Oil / Rich in essential fatty acids, it provides essential nutrition to hair and roots. Contains antioxidants to help repair damage and vitamin E. A great source for hydration smoothing and shine. Coconut Oil / Fatty acids may help with a healthy environment for scalp and hair. Rice Oil / Great moisturizer for sensitive, mature or delicate scalps. Contains Proanthocyanidlins that may protect, also rich in Phytic and Ferullic acids that may help to rejuvenate the scalp. Avocado Oil / Contains nutrients like Vitamin A, D, E and B6, Amino and Folic acids that may benefit the health of hair. Sterols may help hair with moisture retention and effects of UVA an UVB rays. Addresses hair and scalp. Exfoliating, Deep Cleansing, Conditioning and Moisturizing. An in-salon service that stylists offer to clients. BosRenew Scalp Micro-Dermabrasion addresses hair and scalp, improving and making hair and scalp healthier and more youthful looking. Exfoliating dead, flaky skin may allow younger skin to surface and the scalp to become unclogged and clean, providing a healthier environment for new hair growth. Dry Shampoo is to be used only on dry hair. It is perfect for anyone who doesn't wash their hair everyday, needs a quick dry cleanup after the gym, or just wants a refresh on their style. Leaves hair soft with lots of volume and never flakes. It is formulated for fine to medium hair. Removes dirt, excess oil and product build up. DHT Inhibitors help maintain healthy hair and scalp. Keeps hair color safe and lasting longer by lengthening time between washes. Provides UV protection. LifeXtend Complex / Pentapeptides help strengthen and fortify hair follicles and hair shafts creating thicker fuller-looking hair. Apple Stem Cell extract support optimal scalp health. Plankton Extract hydrates and nourishes the hair shaft. Yarrow Extract / Removes excess oil. Also helps give volume and fullness. Moisture Masque provides strength and volume to limp, damaged, or weak hair. Biotin and vegetable proteins strengthen while chamomile and jojoba extract help condition and repair. Provides intense moisture and shine for dull, dry, brittle hair. A luxurious blend of mango and shea butters, with Brazilian palm tree and avocado oils, adds rich moisture and shine. Red wine extract provides beneficial antioxidant protection. Moisture Masque contains LifeXtend complex to help nourish hair and ColorKeeper complex to help prolong and protect color.